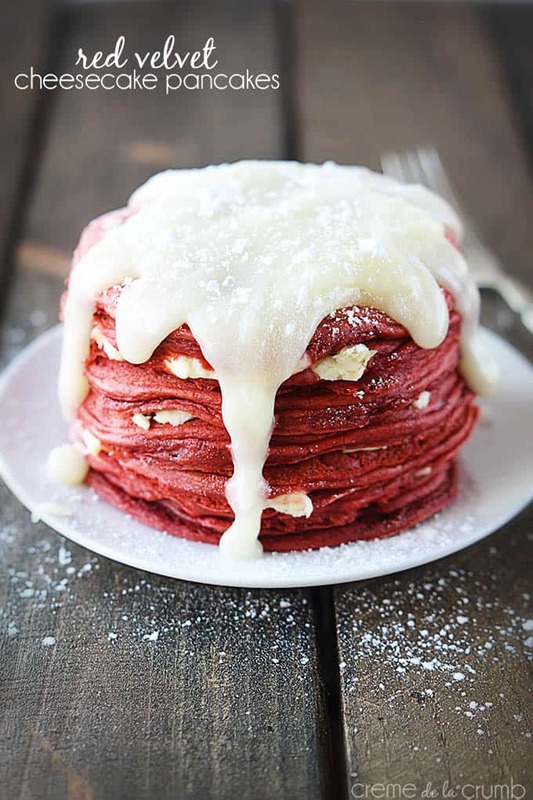 Fluffy Red Velvet Cheesecake Pancakes topped with cream cheese icing… a decadent breakfast that feels like dessert! Until recently, I’d never tried red velvet anything. Crazy huh?? How is that even possible. I think that at any social function where desserts or breakfast food was served (personally I feel that should be every social function ever, why don’t we meet for waffles more often??) I tended to reach for traditional chocolate no matter what else was available. As such, I looked right past the red velvet. Can you blame me? Chocolate is a central part of my diet, a cornerstone to my livelihood. If there is chocolate nearby, I must have it. And it is one of the few things I find really difficult to share (along with french fries and deodorant). But really. Why did no one ever have a red-velvet-only social function? 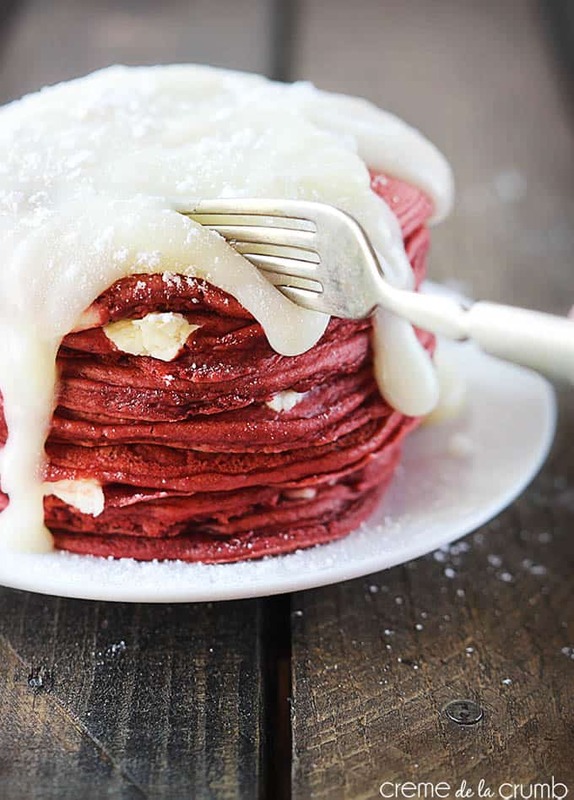 If they had, I would have been forced (you wouldn’t really have to twist my arm here but…) to try something red velvet and my life could have been that much more wonderful all of this time. For instance, I could have been eating these oh-so-amazing dreamy Red Velvet Cupcakes with White Chocolate Frosting all my life. But we’ve only just recently been introduced. I feel like we’ve known each other for decades though. Oh how I adore those cupcakes. You know what’s better than plain red velvet though? Cheesecake red velvet. Ohhhhh yeah baby, welcome to 2014, this is really happening. It’s no secret I love eating anything reminiscent of cake for breakfast. Or heck, just eating straight up for-real cake, I can’t say I’ve never had a slice of leftover birthday cake in the wee hours of the morning. So pancakes are at the top of my Favorite Ways To Start The Day list. But red velvet + cheesecake + warm ooey gooey cream cheese icing? So scrumptious you simply must lick the spoon and so rich you feel like you’ve just won a million dollars?? 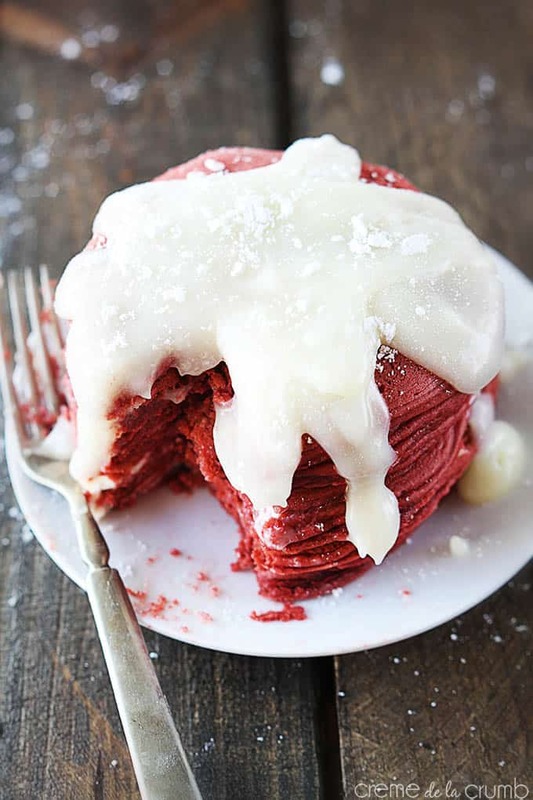 A red velvet spin on your favorite fluffy buttermilk pancakes with a cheesecake twist?!? That, is right at the tippity-top of my list. 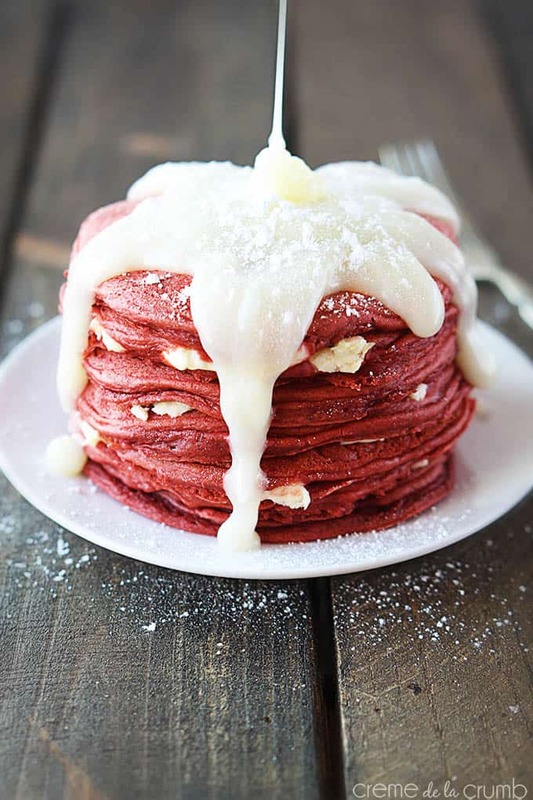 Red Velvet Cheesecake Pancakes with Cream Cheese Icing. An all-time favorite way to start the day. What can beat that? Anything?? Nope! 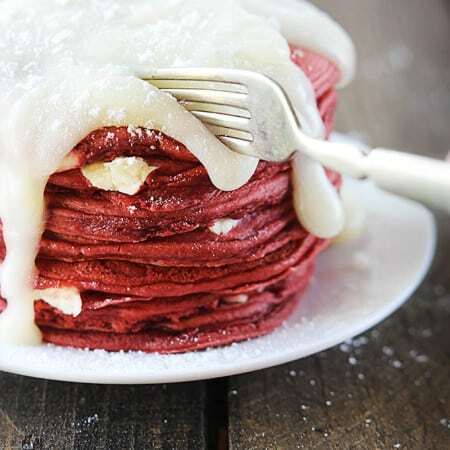 Fluffy red velvet cheesecake pancakes topped with cream cheese icing... a decadent breakfast that feels like dessert! Slice cream cheese lengthwise into long thin pieces, wrap in plastic wrap, and freeze one hour or overnight. Preheat a large pan or nonstick skillet to medium heat and spray with cooking spray. In a large bowl combine flour, baking powder, salt, sugar, cocoa powder and whisk together until well combined. In another bowl combine beaten egg, buttermilk, vanilla, red food coloring and mix until well blended. Make a well in the middle of the dry ingredients. Pour wet ingredients into the dry ingredients. Mix until all ingredients are incorporated. Remove cream cheese from freezer, unwrap and cut into 1/2 inch pieces. Stir cream cheese pieces into pancake batter. Pour 1/4 cup batter onto prepared pan or skillet. Cook 3-4 minutes until top begins to bubble and sides start to look "dry". Carefully flip and cook about 2 minutes longer. Repeat with remaining batter. Whisk all icing ingredients together in a medium sauce pan and heat over low heat. Drizzle over pancakes. Enjoy! i’ve always wanted to try these. they look great! I want these on my table right now. They look so delicious. My mouth is watering at the pictures! How much milk or half and half do you use in the icing? I made these for VDay and the icing was really grainy from the sugar. Any suggestions? It tasted really good, but the texture was off. Great recipe though. Best pancakes I have ever had. Hi, the cream cheese is frozen because it is intended to NOT be blended with the batter. The idea is to get cheesecake “bites” throughout the pancake. As you can see in the photographs, the cream cheese is only in sporadic places through the pancakes, not blended into the batter. Freezing the cream cheese will allow you to enjoy those individual bites of cheesecake. Hope you enjoy these and this clears up your question! I wanted to inform you this blog post will be featured in an upcoming article on SheKnows.ca–Congratulations! To credit your work, your blog will be listed as the image source, and a link-back to your website will be provided. If for any reason you prefer not to be included within this piece, please reach out to me to let me know as soon as possible. If possible, I’d love to have a high-res version of your image. My image requirements are 1920×1080, if you do have that available and wouldn’t mind providing it, please let me know. Don’t you think you should ASK instead of TELLING them you’re about to use their work? Telling them that you’re going to provide a textual credit isn’t receiving proper permission to use their content. Especially if you’re not using a nopin attribute on her images – then you’re also potentially redirecting their traffic. Can’t imagine why you’d need an image of that high of a resolution either, unless you’re planning on printing it. This is pure delicious craziness!! Wow! Looks like a recipe straight from heaven.